No one individual was responsible for the development of the tank. Its design can be drawn back to the eighteenth century. Rather, a number of gradual technological developments brought the development of the tank as we know it closer until its eventual form was unveiled out of necessity by the British army - or rather, navy, since its initial deployment in World War One was, perhaps surprisingly, overseen by the Royal Navy. A (brief) history lesson is in order. The caterpillar track, upon which the tank travelled, was designed in its crudest form in 1770 by Richard Edgeworth. The Crimean War saw a relatively small number of steam powered tractors developed using the caterpillar track to manoeuvre around the battlefield's muddy terrain. Thus even in the 1850s the development of the tank seemed tantalisingly close - except that its development dimmed until the turn of the century. With the 1885 development of the internal combustion engine (by Nikolaus August Otto) a tractor was constructed in the U.S. by the Holt Company which utilised Edgeworth's caterpillar tracks, again to facilitate movement over muddy terrain. It was even suggested at the time that Holt's machine be adapted for military purposes, but the suggestion was never acted upon. Next up was Frederick Simms. In 1899 he designed what he termed a 'motor-war car'. It boasted an engine by Daimler, a bullet-proof casing and armed with two revolving machine guns developed by Hiram Maxim. Offered to the British army it was - as had the machine gun before it - dismissed as of little use. Lord Kitchener, later Britain's War Minister, regarded it damningly as "a pretty mechanical toy". Development in related areas continued despite the British War Office's apparent lack of interest in the machine's potential. Alvin O. Lombard of Penobscot County, Maine, produced and sold the first engine with crawler tracks in May 1901. A British army officer, Colonel Ernest Swinton, and the Secretary of the Committee for Imperial Defence, Maurice Hankey, remained enthusiastic about what they believed to be the enormous potential of the tank, not least in breaking through enemy trench defences. While Hankey produced the first official memo concerning the tank (in a memorandum on 'special devices') on 26 December 1914, it was Swinton who organised a demonstration of the Killen-Strait vehicle to senior politicians in June 1915 - almost a year after the war was underway. In attendance at the demonstration of the Killen-Strait tractor were two future British Prime Ministers: David Lloyd George (who achieved the highest office by the end of the year) and the current First Lord of the Admiralty, Winston Churchill (who had to wait another 25 years before he finally became Prime Minister, in the next world war). During the demonstration the tractor successfully demonstrated its ability to cut through a barbed wire entanglement. Both Churchill and Lloyd George came away impressed by its potential. It was Churchill who, on Colonel Swinton's urging (and backed by Hankey), sponsored the establishment of the Landships Committee to investigate the potential of constructing what amounted to a new military weapon. The name of the committee was derived from the fact that, at least initially, the tank was seen an extension of sea-going warships - hence, a landship. Together the Landships Committee and the Inventions Committee, working with Colonel Swinton, agreed to go ahead with the design of the new weapon, which at that time remained nameless. They therefore commissioned Lieutenant Walter Wilson of the Naval Air Service and William Tritton of William Foster & Co., based in Lincoln, to produce the first landship in secrecy. Its codename, given because the shape of the shell resembled water carriers, was 'tank'; the name, assigned in December 1915, stuck. Swinton laid down certain key criteria that he argued must be part of the finished design. The tank must boast a minimum speed of four miles per hour, be able to climb a five foot high obstacle, successfully span a five foot trench, and - critically - be immune to the effects of small-arms fire. Furthermore, it should possess two machine guns, have a range of twenty miles and be maintained by a crew of ten men. This first tank was given the nickname 'Little Willie' (soon followed by 'Big Willie') and, as with its predecessors, possessed a Daimler engine. Weighing some 14 tons and bearing 12 feet long track frames, the tank could carry three people in cramped conditions. In the event its top speed was three miles per hour on level ground, two miles per hour on rough terrain (actual battlefield conditions in fact). 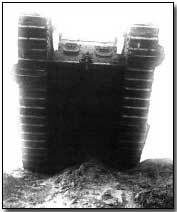 The 'Little Willie' was notably restricted in that it was unable to cross trenches. This handicap was however soon remedied under the energetic enthusiasm of Colonel Swinton. The tank was in many ways merely an extension of the principle of the armoured car. Armoured cars were popular on the Western Front at the start of the war, since at that stage it was very much a war of movement. Their use only dwindled with the onset of static trench warfare, when their utility was questionable. The Royal Navy's role in tank development may seem incongruous but was in fact merely an extension of the role they had played thus far in the use of armoured cars. The navy had deployed squadrons of armoured cars to protect Allied airstrips in Belgium against enemy attack. It was this experience that Churchill drew upon when offering his department's support for the 'landship'. The first combat tank was ready by January 1916 and was demonstrated to a high-powered audience. Convinced, Lloyd George - the Minister of Munitions - ordered production of the heavy Mark I model to begin (the lighter renowned 'Whippets' entered service the following year). Meanwhile the French, who were aware of British tank experimentation, proceeded with their own independent designs, although they remained somewhat sceptical as to its potential; their focus at the time was firmly on the production of ever more battlefield artillery. Nevertheless the French had their own Colonel Swinton, a man named Colonel Estienne. He managed to persuade the French Commander in Chief, Joseph Joffre, of the battlefield potential of the tank as an aid to the infantry. Joffre, ever a champion of the 'offensive spirit', agreed with the result that an initial order for 400 French Schneider (their first tank, named after the factory which produced them) and 400 St. Chaumond tanks was placed, although they were not used until April 1917. Five months after its combat demonstration to the British, in June 1916 the first production line tanks were ready, albeit too late for use at the start of that year's 'big push' - the Battle of the Somme, which began on 1 July 1916. Initially the Royal Navy supplied the crews for the tank. History was made on 15 September 1916 when Captain H. W. Mortimore guided a D1 tank into action at the notorious Delville Wood. Shortly afterwards thirty-six tanks led the way in an attack at Flers. Although the attack was itself successful - the sudden appearance of the new weapon stunned their German opponents - these early tanks proved notoriously unreliable. In part this was because the British, under Commander in Chief Sir Douglas Haig, deployed them before they were truly battle ready in an attempt to break the trench stalemate. They often broke down and became ditched - i.e. stuck in a muddy trench - more often than anticipated. Conditions for the tank crews were also far from ideal. The heat generated inside the tank was tremendous and fumes often nearly choked the men inside. Nevertheless the first tank operators proved their mettle by operating under what amounted to appalling conditions. The first battle honour awarded to a tank operator went to Private A. Smith, awarded the Military Medal for his actions at Delville Wood on 15 September 1916. In April 1917 the French deployed 128 tanks in their Aisne Offensive along the Chemin-des-Dames; unfortunately however they did not distinguish themselves in this battle, once again proving highly unreliable (more so than the early British models). Similarly, at Bullecourt in April/May 1917 the Australians pronounced great dissatisfaction with the tank's performance. Tanks were even deployed during the notorious, almost swampy, conditions of the Third Battle of Ypres (more commonly known as 'Passchendaele'). They promptly sank in the mire and were entirely without benefit. In what many regard as the first truly successful demonstration of the potential of the tank, the entire British Tank Corps (consisting of 474 tanks) saw action at the Battle of Cambrai on 20 November 1917 (although the French can lay claim to its earlier successful use at Malmaison). In a sweepingly successful start to the battle twelve miles of the German front was breached, with the capture of 10,000 German prisoners, 123 guns and 281 machine guns. Unfortunately for the British this enormous initial success was effectively cancelled out in German counter-attacks because the British did not possess sufficient infantry troops to exploit the breach they had created. Nevertheless the successful use of tanks at Cambrai restored dwindling faith in tank development. The U.S. army took note and undertook development of its own tank series. It also acted as a stimulus to the curiously hesitant German army, who had expressed continuing doubts as to the battlefield value of the tank. They too began to hasten production of their own models, although they never pretended enthusiasm for their cause. The U.S. Tank Corps adopted the use of French Renault tanks, light six-ton vehicles designed for close infantry support. Around 200 of these were used in action at St. Mihiel and again at the Battle of Meuse-Argonne during late September/early October (although losses were high in the latter action). The first successful display of German tanks came on 24 April 1918, when thirteen German models, chiefly A7V's, engaged British and Australian infantry at Villers Bretonneux. On 4 July 1918 the tank was used in a manner that helped to fashion the method in which it was deployed in future battles. General John Monash, commander of the Australian Corps, launched an attack at Le Hamel by unleashing a co-ordinated barrage of tanks, artillery and warplanes, all designed to clear a path for advancing infantry. Monash saw no point in attempting to gain ground by using infantry to storm enemy machine gun positions. Rather he believed in using technology to facilitate a relatively uneventful infantry advance, with tanks at their head. His view vindicated, Monash achieved victory at Le Hamel in just 93 minutes. Other commanders took note. 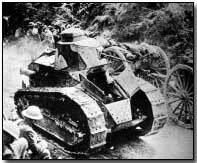 Tanks were increasingly used during the Allied advance of summer 1918. During the French attack at Soissons from 18-26 July no fewer than 336 Schneiders, St Chamonds and Renaults were deployed to support combined French and American infantry. However tank deployment on the grand scale was reached on 8 August 1918, when 604 Allied tanks assisted an Allied 20 mile advance on the Western Front. By the time the war drew to a close the British, the first to use them, had produced some 2,636 tanks. The French produced rather more, 3,870. The Germans, never convinced of its merits, and despite their record for technological innovation, produced just 20. With the French tanks proving more serviceable than their British equivalents they continued to be used beyond wartime. The French Renault F.T. tank continued to grow in popularity as the concept of the tank as a close aid to advancing infantry prospered. Both the U.S. and Italy produced their own tank designs which were based on the French Renault model, a testament to its design strengths. The Italians produced the Fiat 3000 and the U.S. the M1917. Tank design continued to improve beyond the war and the tank, which helped to make trench warfare redundant, restored movement to the battlefield. Its widespread use continues to the present day. A "funk hole" was a dugout to provide a protective hole in which to sleep and get cover.